The magnetic field of a positioning motor has a substantial influence on the performance of a disk drive. Due to an unfavorable design of the components (left top figure) interfering forces are impressed on the positioner leading to vibration and instability problems. The outer field of the positioning motor to be investigated was measured using a magnetic probe (Hall probe) (top right and middle figures). The size of the magnetic field in the materials was determined by a magnetic field analysis (ANSYS) (bottom figure). The magnetic field in the outer area shows an increased elevation where the two magnetic shorted turn halves meet. This reduces the motor’s efficiency. 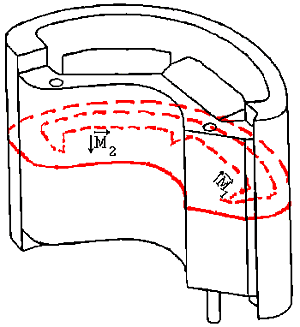 Saturation is achieved at several points of the magnetic shorted turn. 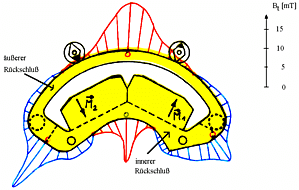 Due to this and due the contour of the magnet, the magnetic fields deviate substantially from the desired radial direction in the air gap, at the middle of the motor as well as at its edges. 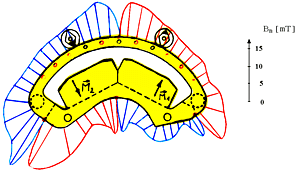 The positioner and the motor therefore, are subject to high interfering forces. This leads to high vibration excitations especially on the outer and inner tracks of the magnetic disk and occasionally to instability during the positioning process. By increasing the amount of screws for mounting the motor to the housing and due to a slightly changed contour of the magnet, this behavior could be improved.